Problem: prolonged status epilepticus leads to upregulation of NMDA receptors, glutamate-mediated excitotoxicity and resistance to conventional antiepileptics. Zeiler, F. A. “Early Use Of The NMDA Receptor Antagonist Ketamine In Refractory And Superrefractory Status Epilepticus”. Critical Care Research and Practice 2015 (2015): 1-5.
no beneficial effect of therapeutic hypothermia vs standard care alone in patients with status epilepticus who are receiving mechanical ventilation. Legriel, Stephane et al. 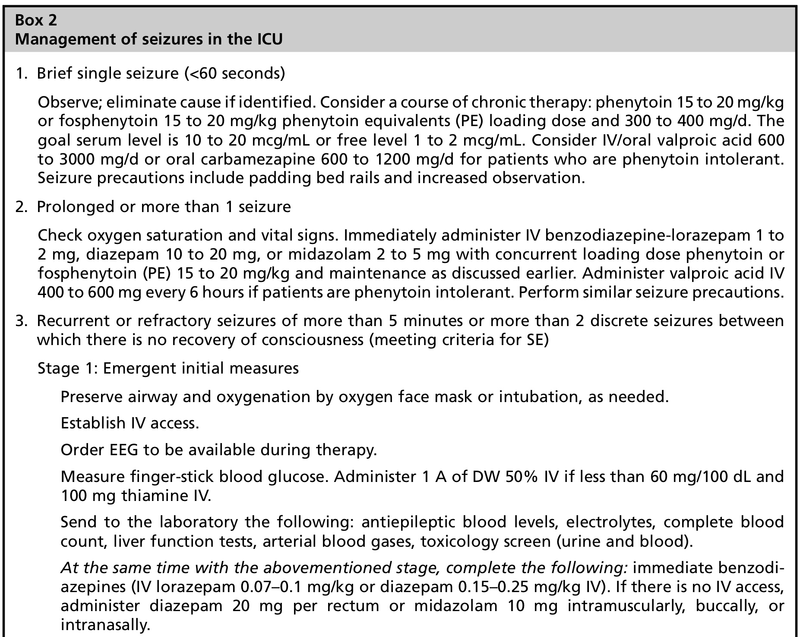 “Hypothermia For Neuroprotection In Convulsive Status Epilepticus”. New England Journal of Medicine 375.25 (2016): 2457-2467. From an old article that I thought gave a good summary. Goodman, D. J., and M. A. Kumar. “Evidence-Based Neurocritical Care”. 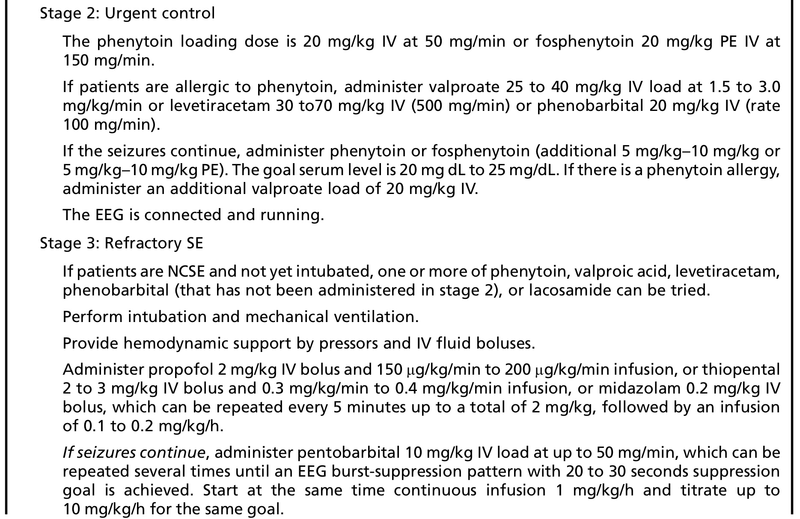 The Neurohospitalist 4.2 (2013): 102-108. Web. 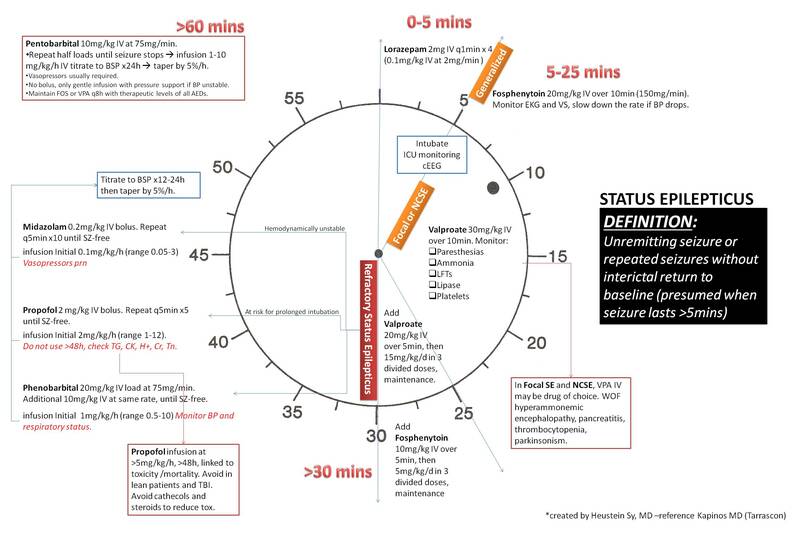 Status epilepticus (SE) can be defined as a seizure of sufficient duration to overcome the inherent cellular mechanisms designed to terminate the seizure. SE becomes a self-sustaining process. Initial League against Epilepsy originally defined SE as 30 mins of sustained seizure activity or 2 or more seizures during this time period without full recovery of the patient. Pathologically, hippocampal neurons begin to die after 30 mins of sustained seizure activity. Newer operational definitions have suggested that seizures lasting longer than 5 mins are unlikely to discontinue spontaneously and should be treated. There is an initiation and maintenance phase. SE is initiated through excessive excitatory stimulation but is maintained through lack of GABA-mediated neuronal suppression. Failure to suppress initial excitatory focus may be due to development of changing GABA isoforms. With sustained seizure, hippocampal GABA A isoforms with different pharmacological properties may develop. This explains the resistance to benzodiazepines that develops during SE over time. SE may also be sustained through excitatory NMDA’mediated neuronal stimulations. NMDA antagonists have been suggested as a possible pharmacologic strategy.